Watch Dogs 2 is officially out today but its "seamless multiplayer" modes aren't quite ready to join in. 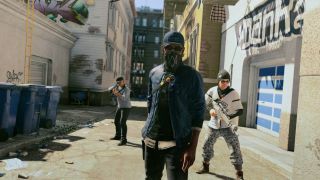 According to an official Ubisoft forum post, the online features that let players drop into each others' games to take down wanted hackers, complete co-op missions, and otherwise encounter one another on the streets of San Francisco will remain offline for the time being due to technical issues. This was also the case during our review period, and it's the reason we haven't been able to assign Watch Dogs 2 a final score yet. It's a shame, since the surprising depth and character of the single-player campaign left us wanting more "for all the right reasons". Apparently it's still better than the alternative - the seamless multiplayer features were apparently causing the game to lag and even crash when enabled before launch. Ubisoft says the "Watch Dogs 2 development team’s priority is working on fixing this issue" though it didn't provide any timeline. Impromptu online modes like Bounty and Hacking Invasion will remain inaccessible until the problems are put to bed, though you can still play co-op by inviting friends into your session.